Ian Rogers makes the familiar strange in Every House is Haunted, taking comfortable locales, experiences, and people and turning them into unfamiliar territory, the realm of the unexpected and weird. Rogers conducts a hauntology of place, showing the role of memory that swirls around the places we visit, the continuing, lurking presence of the bizarre in the dark corners of our existence. 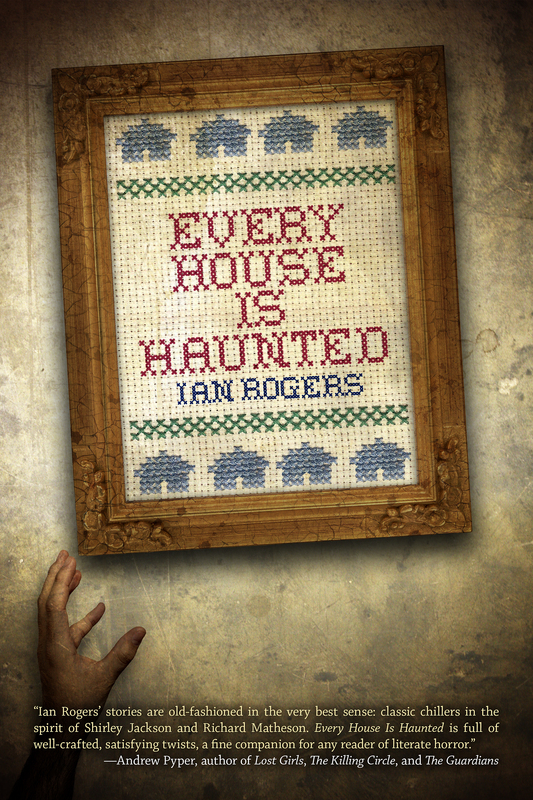 True to its name, Every House is Haunted contains several short stories about haunted houses, but Rogers takes the notion of home and expands it to homely, familiar experiences, and illustrates that haunting can be an experience of the unusual within the ordinary, a subversion of everyday experience. Rogers de-familiarises everything from the experience of constructing buildings, island life, small towns, urban spaces, starting a new job, books, family, and even makes the body itself a foreign and forbidding place. Everything has a dark undercurrent, illustrating the role of secrets and the hidden the underlies our experience. In Rogers’ stories, small towns are places of hidden secrets, urban spaces are places where anything negative is blocked from view, jobs can be places of dark importance where one’s experience is benefitting an unknown party, family histories lurk under their current experiences rising like ghosts from the grave to haunt the descendants, and new knowledge from books can contain a hidden price. There is a predatory quality to objects in Rogers’ books, a haunting un-life and intention that makes everything foreboding. After reading Every House is Haunted, nothing is familiar any more, and everything takes on a sinister quality. Rogers illustrates his fascination with the power of literature and stories by bringing into his own short stories books that can transpose their writing onto human bodies to evoke ancient evils, mediums using stories to help the dead find their way into the otherworld, writing as a means to keep sane during an apocalypse, and the role of stories for giving voice to the under-represented people and even ecologies denied voice. Rogers brings us into moral grey areas, encouraging us to question stories, delve deep into them and interact with them, and also reminds us that every story contains the potential for both danger as well as ecstasy. To find out more about Ian Rogers’ current projects, you can visit his website at http://www.ian-rogers.com/ . You can find out more about Every House is Haunted and other ChiZine books at http://chizinepub.com/ . A review of UnEarthed: The Speculative Elements Series Volume 3 Edited by Sherry Ramsey, Julie Serroul, and Nancy Waldman (Third Person Press, Cape Breton, 2012). 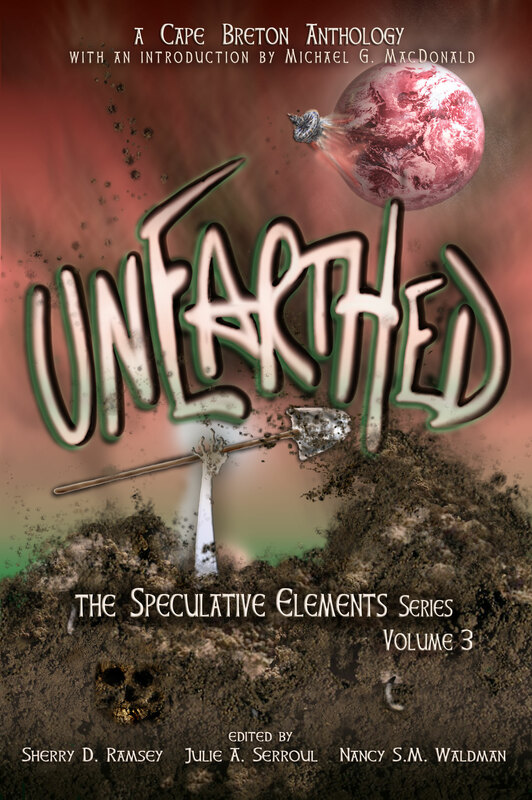 Once again Third Person Press has illustrated the incredible speculative work of Cape Breton authors with the third instalment of their Speculative Elements Series: UnEarthed. This volume, focussed on the element of earth, demonstrates the diversity of speculative stories that can originate from something as simple as the theme of “Earth”. Stories in this volume range from horror, to science fiction, to fantasy, and all of the genre-crossing points between them. Earth in this volume are related to themes of life and death, the hidden, buried things that resurface, notions of home and diaspora, and the general unsettling that can occur when the foundations of the world we live in are shaken, making Earth a ubiquitous symbol for exploring ideas of selfhood and our relationship to the world around us. Although speculative in format, these stories explore classic Canadian themes such as the unearthing of family secrets, unearthing hidden social issues, and unearthing buried memories. The Earth theme serves as a great platform for the classic speculative quality of questioning the hidden aspects of the world around us, and encompasses the horror element of turning the normative, the predictable, the familiar into an unpredictable quality, an unsettling of the norms around us. The stories in this volume range from stories that feature alien mud worlds, spirits of the landscape, zombies crawling from their earthen graves to question ideas of conformity, threats from and to the natural world, buried memories, things hidden beneath the earth, social issues that are buried to make society seem more civilised, the animal buried beneath the surface of human civility, the haunting nature of the past, and notions of home made unfamiliar or violated. This volume explores different forms of knowledge and many of the stories contained within it explore the idea that folklore and story-telling is itself a valid system of knowledge. This is made all the more clear based on the quality of the stories contained in this volume and the ability for these story-tellers to evoke new thoughts and ideas in the reader, unsettling the taken-for-granted notions that they have built around them. UnEarthed illustrates the pedagogical value of story-telling, reminding readers that stories are told to educate and teach the reader that nothing is as it seams and that everything should be questioned, uncovered, and unburied. After reading this book you will never look at things as normal as grass, mud, herbs, or even your own home the same way again. Prepare to have all of your hidden thoughts, worries, and questions unearthed. You can discover more about UnEarthed and the Speculative Elements Series at Third Person Press’ website: http://www.thirdpersonpress.com/ . You can also find a review of one of the short stories in this volume on Speculating Canada posted on September 10th. -Michael G. Coney – The Byrds (In Tesseracts). I had a great opportunity to interview Claude Lalumiere this past weekend and wanted to provide a heads-up that the interview will be appearing on Speculating Canada on Wednesday August 1st. Check in with Speculating Canada to read this fascinating interview and explore the mythical world that Claude Lalumiere creates. A few years ago, when I was Senior Tutor for Trent University’s Champlain College (http://www.trentu.ca/colleges/champlain/) and while I was teaching my course Werewolves as Symbols of the Human Experience at Trent, I decided that I would help my students to meet a current Canadian author. Trent used to frequently have authors in artists in residence who would contribute to the intellectual growth and wellbeing of students and provide an opportunity for students to learn more about the intersection between the academy and the arts. In my werewolf course, one of the key texts was Kelley Armstrong’s Bitten, which was one of my favorite werewolf novels and one of the first novels to get me really excited about Canadian Speculative Fiction. We were able to intrude on Kelley’s busy schedule to have her visit Trent for a week and stay in residence with our students. She was given the guest suite which allows her to interact with students and meet various students on her way to and from events. This level of interaction between students and professionals used to be part of the Trent experience when college dons, the college head, and senior tutor used to live on campus with the students and eat with them in the residence halls. Students had the opportunity to meet with faculty and staff of the university in informal settings, asking questions and having discussions that helped to propel their interest in academic pursuits and the general search for knowledge. Shifts in our societal culture of learning have made these interactions problematic, and, as a former Senior Tutor, I probably would not have enjoyed living in residence with the students (I was fortunate enough to become Senior Tutor after Senior Tutors were able to live off residence). However, there is a virtue to the experience of students seeing that learning can happen outside the classroom and the opportunity for students to interact with people who are contributing to knowledge. The benefit of this experience is not just to students themselves, but also to academics and other knowledge-professionals who interact with them. 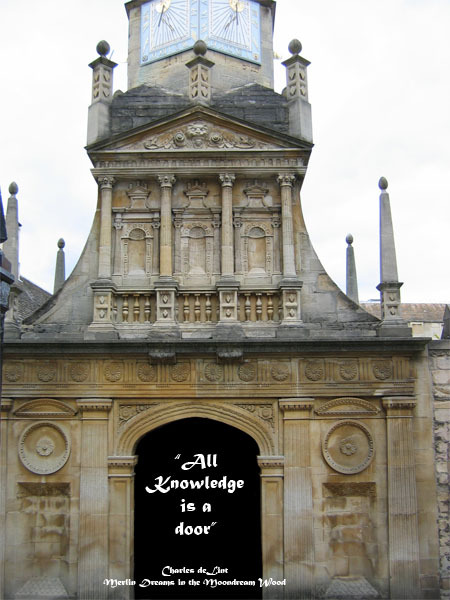 It reminds us that students are knowledgeable and have something to contribute to our knowledge. So often, when we are teaching, there is a tendency to distance ourselves from our students (after all, we have to assess them critically and without bias) but I have found that it is possible to be unbiased and still see our students as contributors to knowledge; not as vessels to be filled with learning, but rather as people who can think of new ideas and question things that are dominant in academic culture. They force us to look at how accessible our work is to a non-academically trained (or little academically trained audience). Because I see students as contributors to knowledge and recognise the importance for our students to engage critically with the world around them and have opportunities to learn outside of the classroom, I thought it would be worthwhile to combine my interest in student teaching outside the classroom with my interest in Canadian Speculative Fiction and invited Kelley to stay at Trent for a week. Kelley and I worked on a schedule of events that accommodated a variety of student interests and her own interests (Kelley was very excited to have the opportunity to engage with young learners). We combined community events with events at the university, having Kelley speak at Peterborough’s Sadleir House (http://www.sadleirhouse.ca/ a space that combines student and community organisations) as well as speaking at various locations at the university, allowing a diverse group of students to have access. Kelley was able to do author readings, book signings, a lecture for my werewolf course, dinners with students, faculty, and staff, author drop-ins with students who were interested in her work, author critiques of student creative writing, and author lectures on creative writing in general, and teen fiction writing in particular. By having Kelley stay in residence, students were able to have those informal conversations and educational moments that taught them that learning happens both in and beyond the classroom. These informal conversations turned out to be some of the most important and valuable experiences for students and for Kelley herself. The enthusiasm of students for an author can be different from a general fan base. They have critical questions and ideas that allow an author to really reflect on her craft and look introspectively at the pedagogical experience of writing. It was very exciting to see students lined up down the hall waiting for the opportunity to talk to Kelley and have her sign their books. As an academic and instructor, it was incredible to be able to facilitate her visit and be involved in her stay. It was incredible to be able to help students and author interact and to see the inspiration spread across the faces of students as they got new and brilliant ideas. Several students came up to me and told me that although they had not thought about becoming authors previous to this, they now had a vision that they felt that they wanted to share with the world. I strongly encourage academics to get involved in facilitating author visits and the opportunities for authors to become authors-in-residence. I also encourage authors to take advantage of these opportunities and facilitate connections to universities. There is nothing quite like seeing the faces of young people as they become inspired by your words of advice or by the passion with which you share your stories and vision. Several of my students mentioned that they had never read Canadian Fiction before meeting Kelley or said that they had never felt that Can Lit spoke to them until they encountered her work. This event evoked a passion in students for Canadian Speculative Fiction.